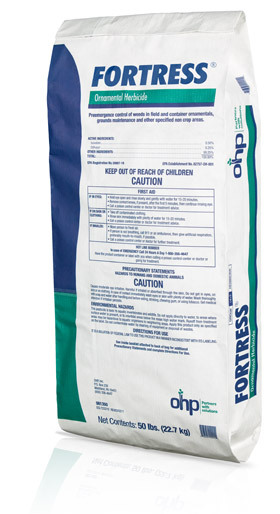 OHP is pleased to announce we have received federal registration for Fortress® Ornamental Herbicide, a pre-emergent granular product that provides outstanding control of broadleaf and grassy weeds on woody plants, perennials, and grasses. Fortress will be available through authorized OHP distributors in early October. A unique combination of isoxaben and dithiopyr, Fortress is manufactured using engineered granules that produce virtually no dust and low odor. Fortress granules are uniformly round and do not hang up in crop canopy, resulting in better plant tolerance and increased safety for the applicator. The Fortress specimen label lists minimal Personal Protection Equipment (PPE) requirements for the applicator. The Fortress label notes many tolerant perennials and grasses along with a detailed list of broadleaf and grassy weeds controlled such as crabgrass, eclipta, bittercress, oxalis, marestail, spurge, purslane, and others. Please click here for current state registrations as well as Fortress label, SDS and product information.